I had never heard of The Swan at Salford or even driven through Salford prior to my first MK Bloggers event in August. 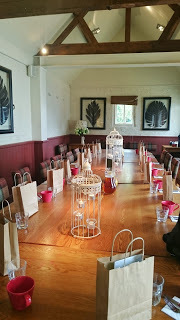 The event, organised by Sophie Davis of Sophie’s Suitcase was a Bloggers Brunch to bring local bloggers in and around Milton Keynes together. 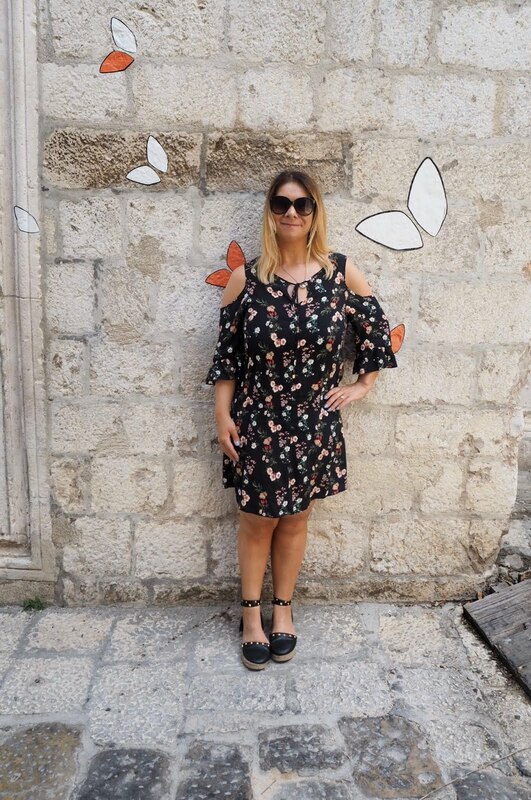 This was my first event and being new to the blogging scene I was anxious beforehand, though the friendly faces of the bloggers and the delightful brunch provided by The Swan soon put an end to my qualms. 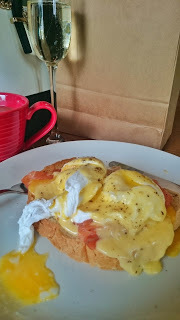 As detailed in my #MKBloggersBrunch post, the Eggs Royale I ordered was cooked to perfection with a warm gooey centre and tasted amazing with the salmon. 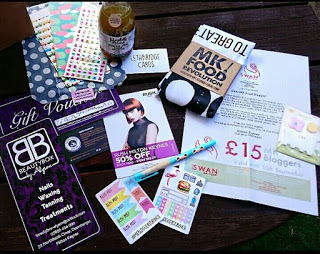 A goodybag was provided for each blogger attendee and included a £15 off meal for two or more voucher, giving us the opportunity to dine at The Swan once more. Being a foodie, looking to find any excuse to dine somewhere new, let alone being given money off to dine; I couldn’t wait to return for dinner with the voucher, which really was the highlight of the goodybag for me. With this in mind, Adam and I booked a table for 8pm on Friday 30th September. We arrived a few minutes early so that I could snap some shots of the front of The Swan, an inviting Edwardian building. Upon arrival, the garden area was lit up with pretty lights, with a few diners enjoying a drink under the twinkling lights. Booking is essential at The Swan, particularly as the restaurant was already full before 8pm. Notwithstanding, we were quickly seated and brought out menus. 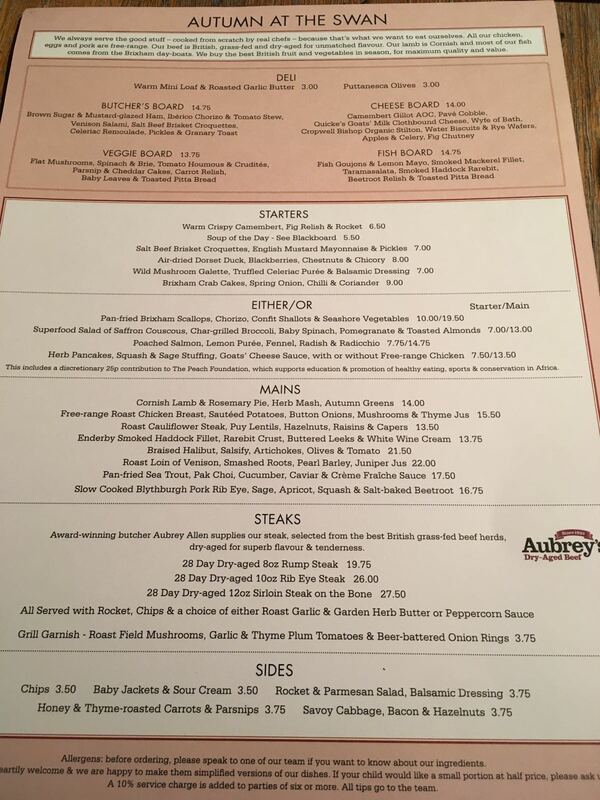 The menu was extensive with a great selection of dishes to please all tastes. To start, I chose the Salt Beef Brisket Croquettes with English Mustard Mayonnaise and Pickles. The flavours of the dish were vast and delectable to the palate, with the flavours from the Mustard Mayonnaise and Pickles infusing my taste buds, which unfortunately, had taken a bit of hit from nursing a cold. Adam chose the classic Autumn favourite, Butternut Squash Soup, which was the soup of the day and had a twist being accompanied by an onion bhaji to enhance its flavour. I was intrigued by the onion bhaji placed within the soup and had to admit the warming appearance of the soup gave me the first glimmer of excitement for Autumn, something I had not yet experienced, being a lover of the warmer weather. It was difficult narrowing down the starters as I was also drawn to the Camembert, Herb Pancakes with Squash & Sage Stuffing with Goats Cheese Sauce and the Scallops. Choosing dishes on menus is often the hardest thing for me when dining out and The Swan was no exception. After the usual deliberation, I decided to have the Scallops for my main instead. The Swan appeared to be limited for staff in the restaurant area, which at times made the service a little slow given the number of diners. Though, this was easily overcome by our waitress, Lauren, who after explaining the mix up with the processing of our order, offered us a selection of appetisers. The appetisers were not required as within five minutes our starters were brought out. The Swan takes pride in using free-range, British ingredients, cooked from scratch by their chefs. Adam chose the Cornish Lamb & Rosemary Pie with Herb Mash and Autumn Greens for main, which he had no problem devouring before I could even get a look in! Must have been tasty! The majority of fish comes from the Brixham day boats with the Pan-fried Brixham Scallops served with Chorizo, Confit Shallots and Seashore Vegetables catching my eye for my main dish. Being pan-fried prevented the scallops from being overcooked and chewy. They tasted fantastic with the shallots, though I personally would have preferred a little more of the creamy sauce. After devouring the scallops, I was in need of another drink and being the designated driver for the evening, the excitement in what drink to choose is often lost. Seeing my dilemma, our waitress Lauren, drew my attention to the Mocktail List and my eyes lit up. My Cranberry Mojito Mocktail was just what I needed; very refreshing and convincing enough to look like I was drinking an alcoholic cocktail to outsiders. Come to think of it, it didn’t taste too different to other cranberry mojitos I’ve enjoyed, which makes me wonder how much alcohol was actually included! Well done to Lauren for introducing me to the Mocktail List and for an efficient service during our meal. 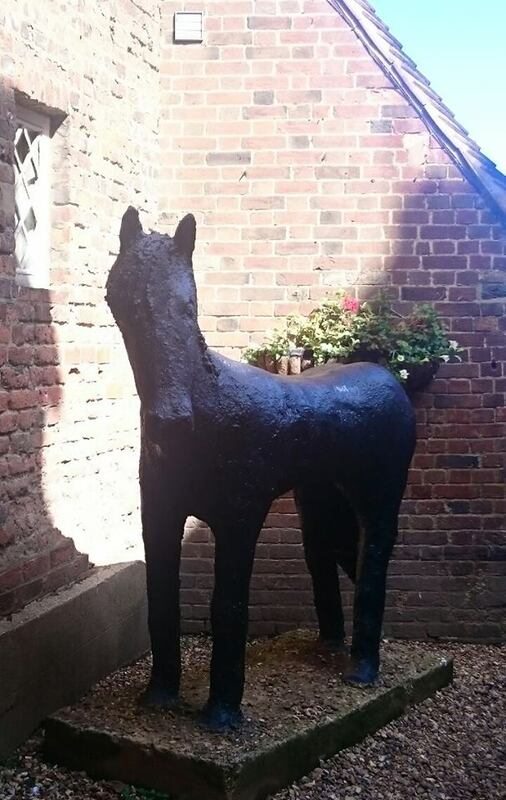 Be sure to check out The Swan in Salford, part of the Peach Pub Group of which The Black Horse in Woburn is also part of. 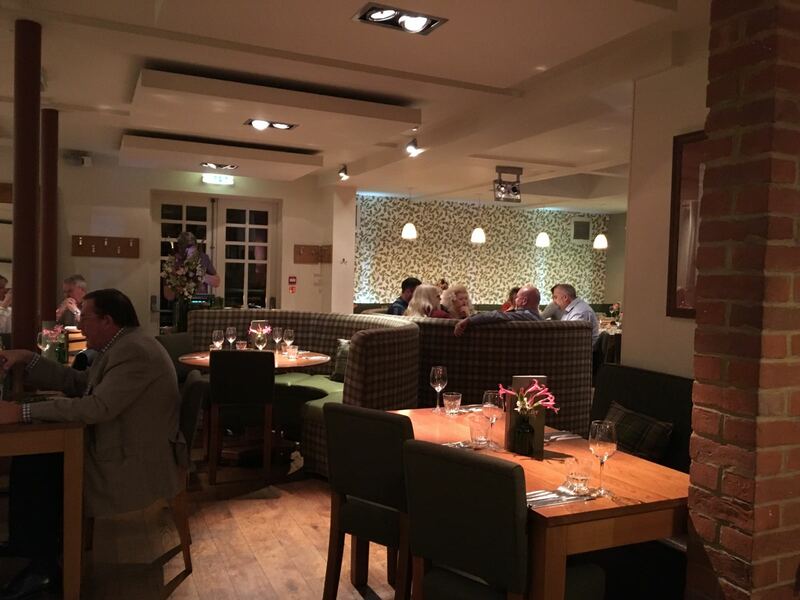 To book a table at The Swan call 01908 281008 or book online by clicking here. Did I mention they also have a cute barn area, which seats up to 28 people meaning it could be ideal for a Christmas event…?! Thank you to The Swan for not only a delicious brunch but also a fantastic meal out – I look forward to dining with you again soon! Do you have a Peach Pub near you?